Galvanized rollers are the most commonly used rollers. The finish helps prevent rust and oxidation, which prolongs the life of the rollers in humid or wet environments. Capacity of 210 lbs. per roller. 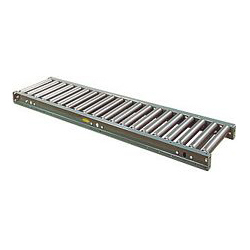 Unplated rollers have no finish to protect them from harsher work environments, but a heavier gauge steel is used, which increases the capacity of these conveyors to 250 lbs. per roller.